This week I felt like some tasty, juicy tomatoes, like the ones in the markets in France, because I had found this delicious garlicky recipe in my Good French Cooking book by Mapie Toulouse-Lautrec. 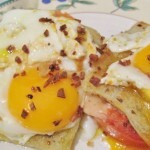 The recipe is really simple and ideal for a brunch or a light supper. The tomatoes are slow cooked then topped with Emmental which melts beautifully over the hot tomato. Added to this is bread fried with garlic and a fried egg. Once the dish is assembled there are lovely layers of different flavours. To match the acidity of tomatoes the recommended wine to pair with them is either a Sauvignon Blanc or a Beaujolais. I decided to pair this flavoursome dish with an Alphonse Mellot Sancerre Blanc 2012. So much of French wine has a long history; Alphonse Mellot is no exception, with an ancestor Cesar Mellot being appointed as Wine Counsellor to Louis XlV. This Sauvignon Blanc wine is a good example of the Sancerre wines with a fresh taste of peaches, gooseberries, aniseed, lime and vanilla. Wash the tomatoes, dry them and slice in half horizontally. Gently heat 4 tablespoons of olive oil in a heavy based frying pan. Place the tomates cut side down in the oil and cook slowly for 10 minutes. Turn the tomatoes over and place sliced Emmental on top, cook for a further 10 minutes. Pour the rest of oil into another heavy based frying pan and heat gently. Finely chop the garlic and add to the oil, fry gently until golden. Just before the tomatoes have cooked, break an egg onto each piece of fried bread and cover with a lid, cook until the egg whites are solid. 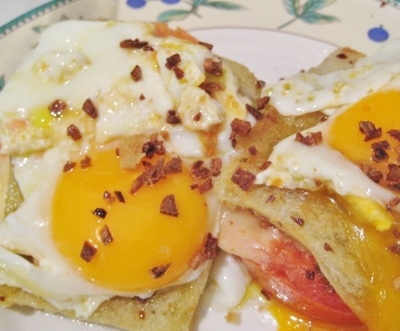 Remove the tomatoes from the pan and place two tomato halves topped with melted cheese per person on a plate, top with the fried bread and fried egg. Sprinkle over the rest of the garlic pieces and serve straight away. I recommend pairing this dish with a bottle of Alphonse Mellot Sancerre Blanc 2012 from the Loire region.